Your manuscript is completed at last and you feel it’s ready for publication. Now what? How to choose a publishing path? Technology has opened the door that made self-publishing not only acceptable but commonplace. Consider what is your end goal? Do you want a book for your family members? Or do you want nationwide distribution? Does the publishing house you are working with provide: artwork, editorial input, hard cover, soft cover, e-books, international distribution and translations, royalties or work for hire, escalation clauses, royalty payments that are connected to past books? The list goes on and on. That is why research is the best answer. Then you will be able to make an informed decision. Last but not least: Ask other authors, and read books on the pros and cons. One last tid-bit: Amazon provides a book titled Decide, Self- Publishing –Trade publishing. Publishing paths: More exist than ever before. This is not necessarily easier for the new writer, it may be more confusing. You can still submit traditionally to agents and established publishing houses, at least those that will take unsolicited manuscripts. Do your homework. Even editors from ‘closed’ houses will sometimes take queries or partials from people who have attended writing conferences where the editors have spoken. There is also self publishing, including epublishing, which is more acceptable than it once was, but still has some drawbacks. The most prestigious awards still are not open to self published books. You will also have to all the work yourself, from designing and setting up the book to PR and distribution. It’s one thing to manufacture a book, another thing to actually sell it. Not many book stores are eager to take books whose quality has not been vetted through the traditional process. Self pubbed books are also harder to get reviewed. Amazon will publish and sell books from your manuscript, but it’s a crowded virtual warehouse! Publishing Paths: There are many paths to publishing your work. No matter how you end up published- by a traditional press, or self-publishing, marketing yourself and your work is the key to success. No matter which path to publication you choose to introduce your book and yourself to the world, both will take patience and perseverance. 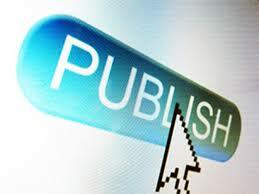 Trade publishing as well as self-publishing will both require marketing skills. Research both areas and decide what suits you and your book. If you choose trade publishing, investigate small publishers and large publishers. Go to the bookstore to discover what types of books each publishes, how the books are designed, what topics or genres each publisher produces. You may find it beneficial to search for an agent to represent you and your book and help you negotiate a contract. Many publishers deal only with agents and don’t accept unsolicited manuscripts from writers. After signing a contract you will receive an advance: money up front that will be worked off with a percent of each book sold. Once you’ve worked off the advance, you’ll receive royalties. A trade book must continue selling well in order to stay in print. If you choose self-publishing, do thorough research on the many avenues available. Hiring a content and copy editor may help you get the polished work you want. If your book has illustrations, you will have to contract with an artist. You will wear all the hats in the publishing world besides being the author. Know ahead of time what your approximate costs will be. If you are fully informed and up to the challenge, there is no reason you can’t be successful on this path. Many authors find this approach satisfying. Most important is to explore all avenues to publication and BE INFORMED so you choose the right one for you and your book .